With the Talk Abroad Travel SIM, we make international cellular service easy and affordable for anyone traveling overseas. The Talk Abroad Travel SIM is compatible with any unlocked GSM cell phone with the appropriate GSM bands. 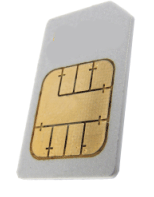 The SIM card has two phone numbers, a US based number as well as a UK based number. Both numbers are always active and do not require a monthly fee. Incoming calls on the UK number are free in more than 70 countries. There is a $0.30 per minute charge to all calls made to the U.S.-based number. You can forward your US or Canadian number to the US number and get the same benefits as roaming without the fees! Or, you can give some of your contacts your new US number and other contacts your UK number. Adding additional talk time is a snap. You may opt for our "auto recharge" option which automatically keeps your credit above $10.00, or you can speak to a live rep (toll free) - you can even simply enter a 5-digit code on your handset to add call credit. The Talk Abroad network also supports data functions, so if you need a data solution that works in 130+ countries, with 3G speed available in over 70 popular destinations, the Talk Abroad Talk Abroad Travel SIM Card is an excellent value. Talk Abroad Travel SIM is available in standard, micro and nano sizes. Most iPhone 4 and 4s as well as the Samsung Galaxy use micro SIM cards while the iPhone 5 uses the nano SIM card. Whether you are a frequent business traveler or a tourist seeking a reliable yet affordable calling solution, the Talk Abroad Travel SIM will cover you in over 200 countries. Since this is a prepaid solution, there are no contracts to sign or monthly bills - ever! To check your balance, power on your phone and wait for it to pick up a network. Then, dial *187# and then the send/call key. Your balance will be displayed on your handset. Have extra talk time credit added to your prepaid account online. Re-charge credits for the Talk Abroad™ SIM Card typically add 30 minutes worth of talk time to your SIM card. Please see our rate calculator. More talk time is just a phone call away! Add $29.00 of credit instantly by dialing *161# SEND directly from your Talk Abroad handset. You must add a $29 recharge voucher once every 12 month or you will forfeit your international cellular number and remaining credit. For detailed information on using the Talk Abroad Prepaid SIM card, please click here. How much credit will I need to use the Talk Abroad SIM for Data service? The Talk Abroad Travel SIM supports data in many countries. Please refer to the Call Rates and Features tab for exact rates but as a rule of thumb, this is an average of what you can expect for service in Europe for each $29 of credit. Why do I need a data SIM card? Simply make a call in order to activate your Talk Abroad� International SIM card. Your service is valid for 12 months from the day of activation. Recharging your SIM card (adding talk time), extends the validity for another 12 months from the day you add the credit. Please note that while the service does work in North America (in areas with GSM coverage), the service is intended for use overseas and therefore, placing a call from your handset in North America is expensive. You will have U.K. and U.S. phone numbers, regardless of where you are traveling. Your phone numbers are emailed to you the same day your order ships, typically same or next business day for purchases, and will be clearly marked on you invoice. You may check your credit at any time by dialing *187# on your handset for free. You can also check your credit online. You will receive a text message with your current credit. You can add talk time at any time - together with your purchase as well as prior to and during your trip. Choose the "Auto-credit topup" option during checkout to enable your credit to be recharged automatically every time your credit drops below $10.00. Alternatively, you can add $29 to your account at any time while traveling, instantly, by dialing *161# send from your handset. Additional call credit is $29 for roughly 42 minutes of talk time (for most popular destinations). Each time you add call credit or �recharge� your account, you will extend your service life for an additional 12 months from the date of the recharge. Previous call credit will accumulate to your new call credit. When you make a call, charges begin only when the other party answers the call or if the call goes to voicemail. Outgoing and incoming call charges, where applicable, are based on 60-second intervals. If you do not have an unlocked tri or quad band GSM phone, please check out our discounted deals for a Talk Abroad International SIM card and GSM phone packages. Your voice mail is already activated. You can access your voice mail system from your handset. It's the cost of a call to the UK from your location. From your handset, you dial a 3 digit number as per our instructions and follow the prompts to listen to messages. You will receive a text message alerting you of any new voicemails. You can send and receive SMS text messages from your Talk Abroad� international cell phone to and from your UK number. However, we nor any carrier, can be responsible nor guarantee that you will always be able to send and receive SMS messages in all circumstances and in all countries. SMS text messages are free to receive and are $0.60 to send, regardless of the country. Data services are now available for all Talk Abroad service users. Our rates are listed per megabyte, but we bill your prepaid credit for each 100kb - so if you only use 100KB of data, you will only be billed 1/10 of the per megabyte rate listed in the table below.